1st Layer: 5&1/4" by 4" olive green paper then glued to base using Scrap Happy Glue. 5&1/4" by 1&1/2" strip of green with white dot paper that is glued to a 5&1/4" by 2" strip of blue scroll pattern paper. 4" by 3" piece of gold shimmer cardstock--and stamped the bird stamp in the upper right corner, using Versamark, and embossing with Silver Medal embossing powder. I added a few rhinestones near the bird's head. 1&5/8" by 1&1/4" piece of gold shimmer cardstock--stamped with sentiment in Versamark, and embossed with Black fine detail embossing powder. This is glued to a 1&3/4" by 1&3/8" piece of burgundy cardstock (as a mat for the sentiment). 3&3/4" by 3/4" piece of olive green paper cut into a banner and glued to a 4" by 1" strip of burgundy cardstock cut into a banner. This piece is glued to a 3" by 1&1/2" piece of blue scroll paper and two rhinestones are added to the right side. Then I cut a 6" piece of olive green seam binding. 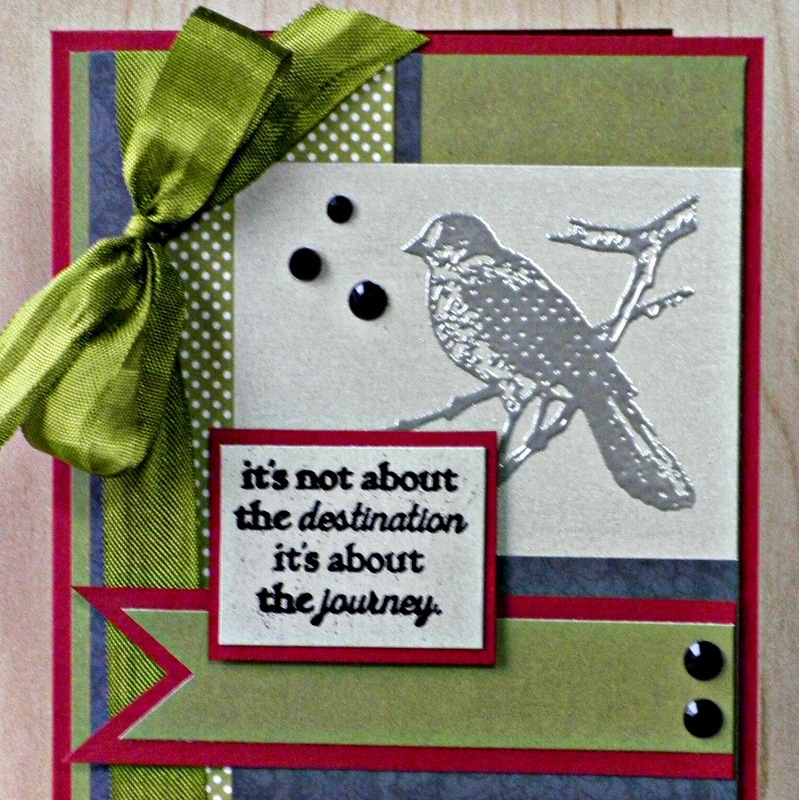 The finishing touch was to add the bird piece to the center of the card (lined up with the green paper on the right side) and foam tape the sentiment below the bird. I added a seam binding bow to finish it. Thanks for stoppin' by the cafe' today! 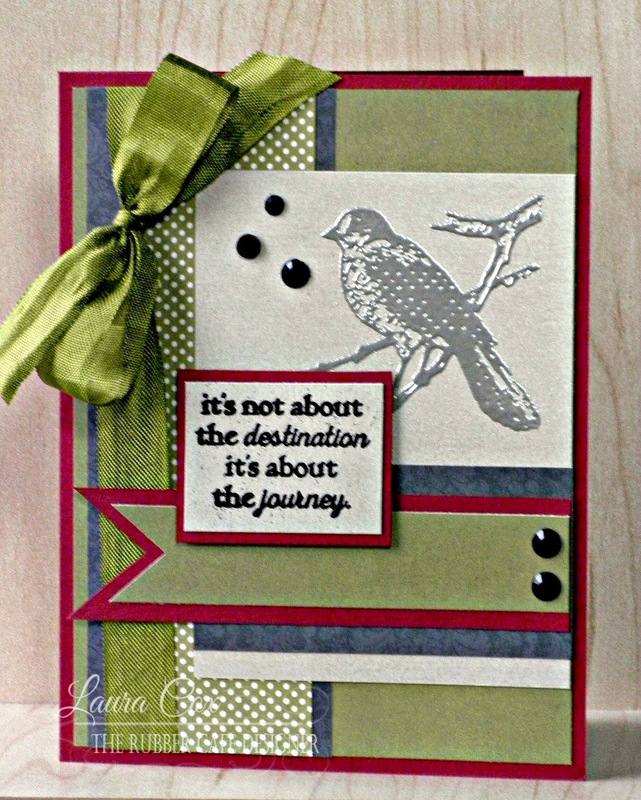 Stop back soon for more creating with the amazing kit! I could not find the Blue Scroll paper, that you referred to when making this card, in the 6x6 paper pad Moments & Memories by Carta Bella that came in the kit. Am I missing something?